IDICBeer 40k: My Las Vegas Open Game - Necron List! My Las Vegas Open Game - Necron List! Continuing on from my previous post and the practice game I am having with my buddy Aceface on his journey to the Las Vegas Open this year, and it's time to reveal my army list! I am going to bolt on a Destroyer Cult Formation to the Reclamation Legion. I know that most of Aceface's Tau army has a 2+ save and this may not be the best choice, but just a side note on that. I am not making a list specifically to beat HIS army. I want the list to have elements of what I think he might see at the event, and to give him some experience of it on the table. It is just a practice game after all! Besides, I will have three Heavy Destroyers for some AP2 busting, and the two Stormsurges he has will only get their 4++ against the Destroyers. 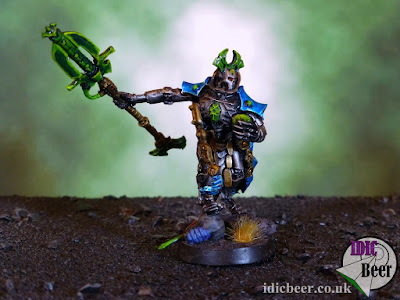 I also want to play my Necrons a little different than I normally do on the table, I want to be ultra aggressive with them. Ten Sword and Board Lychguard with a Solar Staff Cryptek, Vargard and two Overlords with Warscythes. This unit will teleport turn one, pop the staff off and hopefully put the Tau on the backfoot. The unit will have a 3++ save, a 4+ RP roll (even with instant death thanks to Technomancer) and they get to re-roll the failed RP rolls of a one thanks to the Overlord. The unit is very survivable and has three Warscythes to boot for some decent killing power, all be it at initiative two. The other great thing about the unit is that I get to use my old Pariah models!